The risk of a military confrontation between China and Vietnam is rising. Although the two countries have enjoyed close party-to-party ties for decades, since 2011 they have both asserted conflicting claims to the South China Sea. Beijing claims 90 percent of the sea as its exclusive economic zone. China has repeatedly moved oil rigs into disputed areas, dredged and occupied parts of the disputed Paracel Islands, and constructed at least one and potentially multiple airstrips, possibly for military use, in the Spratly Islands. Vietnam has also tried to use oil explorations to claim disputed areas of the sea and reportedly has rammed Chinese vessels in disputed waters. Vietnam has cultivated close military ties to the United States, to other Southeast Asian nations like the Philippines, and to regional powers such as India, all to the consternation of China. In addition, Vietnam and China increasingly compete for influence in mainland Southeast Asia, where Vietnam had dominated between the 1970s and late 2000s. China has become the largest aid donor and investor in many mainland Southeast Asian nations, as well as an important military partner to Myanmar, Cambodia, Thailand, and Laos. Rising nationalism in both Vietnam and China fuels this race for regional influence and makes it harder for leaders in each country to back down from any confrontation, whatever the initial genesis. China has reasserted claims to roughly 90 percent of the South China Sea as its exclusive economic zone. These growing sources of friction could lead to a serious military confrontation between the two countries in the next twelve to eighteen months, with potentially significant consequences for the United States. Accordingly, the United States should seek to defuse tensions and help avert a serious crisis. Escalation of tensions over disputed territory in the South China Sea. For much of the 1990s and 2000s, China's government, although never relinquishing long-standing claims to the South China Sea, took a less assertive approach to disputes with other claimants. Yet in the past five years, China has reasserted claims to roughly 90 percent of the South China Sea as its exclusive economic zone. Vietnam has responded forcefully, initiating its own land-reclamation projects in the Spratly Islands, and at Sand Cay and West London Reef. In addition, though the South China Sea has always been important strategically, its perceived economic value has increased over the past decade. The U.S. Geological Survey estimates that the sea contains as much as 290 trillion cubic feet of natural gas. The South China Sea also accounts for about one-tenth of the entire annual global fish catch. In May 2014, the state-owned China National Petroleum Corporation (CNPC) moved an oil rig into waters claimed by Vietnam. Naval and coast guard vessels faced off around the rig, and anti-China riots erupted in Vietnam. Though the two countries eventually defused the crisis, it followed several weeks of tensions in which senior Chinese and Vietnamese leaders ignored each other. It is possible a similar incident could erupt in the near future and escalate; some reports in July 2015 suggested that China has already begun redeploying a rig in the same waters contested in 2014. If CNPC were to explore again in this region, or in blocks along Vietnam's coast, its rigs probably would be accompanied by China's increasingly sophisticated paramilitary forces and naval vessels. China has dramatically expanded its base at Hainan Island to accommodate its growing navy, while Vietnam also has begun modernizing its surface and submarine forces. With their naval vessels facing off against one another, Vietnam and China could exchange deadly fire. Hanoi and Beijing might reinforce their positions on the sea with more naval assets, frequent air patrols, and contingents of special forces. The two countries have never adopted a memorandum of understanding (MOU) about how to resolve maritime disputes; in 2011, Hanoi and Beijing signed an agreement on general guidelines for addressing maritime conflicts, but have not progressed beyond generalities. Although the Association of Southeast Asian Nations (ASEAN) could theoretically mediate a dispute, the organization's mediation capabilities, housed in its Institute for Peace and Reconciliation, are limited and untested. If the two sides did not de-escalate, China and Vietnam eventually could wind up fighting an outright, if limited, naval war. The Chinese and Vietnamese regimes, though authoritarian, also cannot ignore public opinion. Exchanges of fire across the China-Vietnam land border. The China-Vietnam land border has become increasingly tense as security forces on both sides have traded fire at least twice in 2014 and 2015. The reasons for these incidents remain unclear—Chinese border guards may have been firing at fleeing Uighur migrants. But they have made the land border more dangerous. Further clashes, particularly if they coincide with increased tensions over other disputes like the South China Sea or the Mekong River, where China's upstream dams have infuriated Vietnam, could lead China and Vietnam to reinforce the land border, heightening the danger of further military escalation. The Vietnamese government also may fear that if it does not take decisive action in any scenario on the land border with China, it risks looking weak to other countries in mainland Southeast Asia, where Vietnam is trying to maintain strategic influence. The Chinese and Vietnamese regimes, though authoritarian, also cannot ignore public opinion; the Vietnamese public in particular is sensitive to any perceived Chinese attempt to control the land border, in part because China and Vietnam fought a bloody border war in 1979. Unintended military interactions surrounding a Vietnamese military exercise with Hanoi's new strategic partners. Vietnam has begun to hold military exercises of various kinds with Hanoi's rapidly expanding array of strategic partners. In the near future, these exercises probably will include naval exercises with India, the Philippines, Singapore, and even the United States and Japan. 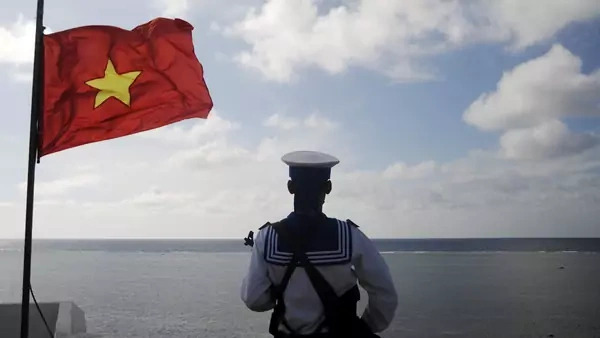 These are likely to be closely monitored by China, even if the exercises take place in waters or air zones other than the South China Sea; Beijing has often been hostile to new Vietnamese partnerships. For example, China condemned an informal meeting between Vietnamese and Philippine soldiers on the disputed island of Northeast Cay in May. In the future, Beijing may try to counter Vietnam's joint exercises, which it fears hinder China's power projection abilities. Beijing might move air and naval assets nearby, even if the exercises are held in areas far from the Chinese coast or outside the South China Sea. Assertive Chinese naval and air patrolling near military exercises could pose dangers. The potential for unwanted incidents, such as planes buzzing each other or forcing each other to the ground, or ships firing close to each other, would escalate. Public anti-China protests in Vietnam or anti-Vietnam rallies in China would be a sign of rising bilateral tensions. Official Chinese and Vietnamese public declarations. Although neither China nor Vietnam is known for allowing media access to senior leaders, both governments have held press conferences to denounce each other after policy announcements related to the South China Sea, the China-Vietnam border, and other contentious issues. These press conferences and written public statements tend to consist of Chinese or Vietnamese senior spokespeople reading indictments of the other side. Neither government normally holds press conferences to announce positive developments in bilateral relations. News of a press conference in Beijing or Hanoi related to China-Vietnam relations thus should be seen as a general sign of rising bilateral tensions. Mobilization of public protests. On several occasions in the past three years, large anti-China demonstrations have been held in Hanoi and Ho Chi Minh City, usually to protest Chinese activities in the South China Sea, although sometimes to demonstrate against other actions taken by Beijing. Though less common, there also have been anti-Vietnam protests held in Beijing since the early 2010s. It can be assumed that anti-China and anti-Vietnam public demonstrations are tacitly supported by the governments. The presence of public anti-China protests in Vietnam or anti-Vietnam rallies in China would be a sign of rising bilateral tensions. Announcements of new Vietnamese strategic partnerships. Vietnam is actively looking to formalize closer relationships with even more regional powers, such as Indonesia, that share its concerns about Chinese dominance. An announcement of a new Vietnamese strategic partnership with another Asian nation like Indonesia should be seen as a potential sign of rising tensions between Beijing and Hanoi. Chinese aid initiatives in mainland Southeast Asia. Over the past five years, China has used visits by senior Chinese leaders to mainland Southeast Asian nations to announce large new aid packages. These initiatives have clearly worried Hanoi. After then Vice President Xi Jinping's visit to Cambodia in 2010, during which China announced $1.2 billion in new aid deliveries to Phnom Penh, Vietnamese leaders scrambled to get Cambodian Prime Minister Hun Sen to publicly highlight his bond with Hanoi. Anti-China sentiment in Vietnam spiked at that time, possibly in part due to official encouragement. Movement of oil rigs into disputed waters and/or declarations of claims. China and Vietnam have both used official statements, often issued during party meetings, to enunciate claims in the South China Sea. They have also used state-owned petroleum companies as tools to claim disputed areas. In the past, both China and Vietnam have responded rapidly to the other side's new oil and gas explorations by increasing patrols in disputed areas or cutting the cables of survey ships. Thus, official statements on or announcements of new exploration in the South China Sea could signal an impending military crisis. China and Vietnam have no agreement on rules for air-to-air encounters. Army drills near the China-Vietnam land border. Given that neither China nor Vietnam currently conducts regular army exercises near the land border, drills close to the border could signal an impending confrontation. Chinese military preparations in response to announced exercises by Vietnam and its partners. Chinese fighter jets have been increasingly willing in recent years to fly dangerously close to foreign surveillance and fighter planes, both in airspace near and much farther away from the Chinese coast. China and Vietnam have no agreement on rules for air-to-air encounters, and China has no agreement on air encounters with Vietnam's partners, including the United States. Reports of Chinese interceptions of Vietnamese planes, especially when Vietnam is conducting an exercise with Hanoi's partners, should be considered tactical warning indicators. Any military crisis involving China and Vietnam could harm U.S. interests, but the potential damage to U.S. interests stemming from a China-Vietnam maritime crisis would be exponentially greater than damage stemming from a land border conflict. For one, a crisis that closed part of the South China Sea, even for a few days, could cause serious damage to the international economy because the sea is so vital to shipping and there are few real alternative routes for trade. Over $5 trillion in trade passes through the sea annually, including more than half of the world's trade in liquid natural gas and over 33 percent of trade in crude oil. A land border conflict would not necessarily threaten freedom of navigation and trade in Southeast Asia, although it could affect U.S. companies' manufacturing in Vietnam and China, and could send a shock into global financial markets. A land border conflict, especially one in which it was unclear which side provoked the confrontation, also might not draw in U.S. allies in Asia or result in a wider confrontation. Vietnamese partners like the Philippines, India, and Singapore have focused their military relationships on maritime cooperation and are unlikely to come to Hanoi's defense in a land border conflict. However, a conflict over the South China Sea or over Vietnam's new strategic partnerships could draw in U.S. allies, like the Philippines or Japan, and complicate efforts to resolve other territorial disputes in East Asia. More broadly, a China-Vietnam maritime dispute would potentially increase the prospect of a much more adversarial relationship developing between China and other Asian nations. China could speed up its dredging, runway construction, and other actions in disputed maritime areas. Japan, the Philippines, Indonesia, and Singapore—among other nations—might formalize and expand their military relations and increase their defense spending to hedge against China. The Philippines, Japan, Vietnam, and possibly Indonesia, also might try to speed up their own land reclamation efforts in disputed maritime areas. East Asia already has witnessed a rapid naval and air arms race over the past decade. A further increase in the speed of that arms race, along with more tests of naval and air assets, heightens the potential for miscalculation, confrontation, and even outright war. Despite the possibility that this arms race could make miscalculation and conflict more likely, a maritime crisis between Vietnam and China could theoretically serve U.S. interests in Asia. A crisis that stemmed primarily from aggressive Chinese action, and that was met with a U.S. response that prompted China to back down but averted conflict, could lead Asian nations to strengthen military relationships with the United States. Nations like Malaysia and Singapore that already are U.S. partners might seek to formalize ties with the United States via treaties and to curtail their military cooperation with China. Countries such as Indonesia that currently have limited military ties with the United States might seek to rapidly expand military relations. A code of conduct for vessels operating in the South China Sea could be the most effective cooperative strategy. However, a scenario in which a maritime crisis leads Asian nations to boost ties to the United States, yet naval warfare is averted, cannot be taken for granted. If a maritime crisis erupted and a U.S. response was ineffective, prolonging the conflict and failing to prevent China from retreating, even close U.S. partners could seek to bolster ties with China at the expense of military relations with Washington. Even if a U.S. response to a maritime crisis was effective, prompting Beijing to back down, some Asian nations, such as Indonesia or Malaysia, still might decide to bolster military relationships with China and reduce their cooperation with the United States, calculating that there is no way to halt China's assertive actions in Asian waters over the long term. And even if Washington responded effectively to a crisis, and Asian nations sought closer military relations with the United States, these same countries still might continue rapidly expanding their naval and air capabilities. The same risks of an arms race leading to miscalculation and escalation in Asian waters and skies would exist. The United States has several options to lower the risk of a China-Vietnam military crisis, although U.S. influence over China and even Vietnam is limited. These include strategies to promote cooperation, options designed to bolster Vietnam's ability to deter Chinese actions that threaten freedom of navigation and/or U.S. strategic interests, and options that would allow the United States to disengage from a China-Vietnam conflict that did not threaten U.S. strategic interest or involve U.S. allies. Promote cooperation. A code of conduct for vessels operating in the South China Sea could be the most effective cooperative strategy. China and Southeast Asian nations have participated in talks about a code of conduct since September 2013. Yet the ten members of ASEAN have been divided on how forcefully to press for a code of conduct and what to include in such a code. In other disputes, China has responded proactively when ASEAN countries have presented a unified stance; since the late 2000s, as many Southeast Asian nations have complained about the environmental effects of Chinese state firms' projects in the region, Chinese companies have responded by devoting funds and time to corporate social welfare programs. The United States could work with Vietnam and other Southeast Asian nations to create a united position on a code of conduct. If China refuses to participate in further discussions on a code of conduct, the United States should encourage ASEAN to develop its own draft code and to present it publicly to Beijing. A second cooperative strategy could be to promote ASEAN-China joint economic and scientific projects in the South China Sea, such as programs to codify the marine biodiversity. These scientific projects build trust and could lead to joint ASEAN-China oil and gas exploration projects, which could have the potential to dramatically reduce tensions. A third cooperative strategy could be to encourage joint China-Vietnam patrols of the two countries' land border, although U.S. influence over issues related to the China-Vietnam land border is extremely limited. Although the two countries' border police hold regular consultations and sometimes exchange intelligence, they do not conduct joint patrols, which The United States also could help improve Vietnam's defenses by developing annual U.S.-Vietnam combat exercises.would put senior officers in closer communication and reduce the risk of exchanges of fire along the border. China is unlikely to halt its actions if the United States retains an ambiguous stance on the South China Sea. Use naval maneuvers, arms sales, declarations of U.S. policy, and joint exercises to deter China. A preventive strategy could also be one of deterrence, which could be adopted in the South China Sea at the same time that the United States encourages cooperative measures. The United States could send U.S. naval vessels through areas of the South China Sea where China has just prevented boats from Vietnam or another country from traveling, to demonstrate U.S. commitment to freedom of navigation. The United States has already used a variant of this strategy by purposefully sending B-52 bombers through disputed areas claimed by China as its air defense zone without informing China in advance. A second step could be to use public and private diplomacy to clarify U.S. commitments to allies with claims in the South China Sea. U.S. leaders could state publicly that U.S. forces will come to the aid of any treaty allies if they face unprovoked attacks in areas of the South China Sea claimed by multiple countries. Currently, U.S. officials have only vaguely stated that freedom of navigation in the South China Sea is a U.S. national interest. Clearer public and private U.S. statements about the South China Sea risk antagonizing China and contributing to escalation, but even without clear U.S. declarations on the South China Sea, Beijing is rapidly dredging and militarizing disputed maritime areas. China is unlikely to halt its actions if the United States retains an ambiguous stance on the South China Sea. In the event of an unprovoked attack on a U.S. treaty ally in the South China Sea, the United States would almost surely be obligated to help in defense, whether or not Washington had made clear public statements in advance. Not assisting in a partner's defense could dramatically undermine the United States' image as guarantor of regional security. The United States also could help improve Vietnam's defenses by developing annual U.S.-Vietnam combat exercises. In addition, the United States could minimize the possibility of its public statements antagonizing China by simultaneously delivering public warnings to its partners in the South China Sea region—Vietnam, the Philippines, Indonesia, and Malaysia—that the United States will not necessarily defend them in a maritime conflict if they provoked the crisis. Examples of such provocation would be if one preemptively attacked Chinese vessels or blocked Chinese vessels from navigating international waters. A third step could be to upgrade Vietnam's defense capabilities by expanding the range of U.S. lethal arms sales to Hanoi, which Congress approved in autumn 2014, to include aircraft and naval vessels. The United States also could help improve Vietnam's defenses by developing annual U.S.-Vietnam combat exercises. These types of deterrence could put U.S., Vietnamese, and Chinese forces into close proximity and heighten the risk of miscalculation. Yet deterrence could be effective in stopping China from projecting power in ways that could provoke a confrontation with its neighbors. Decrease exposure to a China-Vietnam land confrontation in mainland Southeast Asia. A strategy of minimizing U.S. involvement in any potential land border conflict or broader rivalry over mainland Southeast Asia could be the best option for the United States. The United States has minimal strategic and economic interests in much of mainland Southeast Asia; the China-Vietnam land border does not matter significantly to the U.S. economy, and the United States has allowed other partners in Asia to resolve land border disputes without any U.S. involvement. However, a strategy of avoiding any involvement in a China-Vietnam land conflict could frustrate Vietnam and could encourage China to act more assertively throughout the region. It also could be interpreted by other U.S. partners in Asia as a dangerous precedent if the United States declined to respond to Chinese provocation. Still, even without outside assistance, Vietnam has extensive land defenses and is far better prepared to defend its northern border than it is to defend its interests at sea. U.S. public and private diplomacy regarding the South China Sea also could help minimize Asian partners' fears that U.S. avoidance of a land conflict would encourage Chinese assertiveness throughout Southeast Asia. The United States could employ several preventive measures to defuse a military crisis. These options—though limited by the fact that Vietnam is not a treaty ally and that the U.S.-China relationship remains contentious—range from strategies promoting consensual de-escalation to more coercive measures. Although Vietnam is not an ally, the United States likely has more influence with Hanoi than any other outside power. Cooperative: Encourage Hanoi and Beijing to use hotlines and high-level meetings, and urge Vietnam's partners to immediately hold meetings with senior Chinese leaders. Although China and Vietnam launched a hotline in 2013 so that top leaders could speak directly to each other, both governments ignored this tool during the May 2014 crisis. In addition, the two countries refused for a month to convene a meeting of high-level Vietnamese and Chinese leaders. If another standoff occurs in the South China Sea, over Vietnam's military exercises, or along the China-Vietnam border, Washington could encourage both Hanoi and Beijing to use their private hotline immediately; although Vietnam is not an ally, the United States probably has more influence with Hanoi than any other outside power does. If the military crisis stemmed from incidents after Vietnamese exercises with partners like the Philippines or India, the United States could push nations like the Philippines—with which Washington has significant influence—to initiate their own leaders' meetings with Beijing, in secret if necessary, to deescalate the crisis. Coercive: Convene an Emergency United Nations (UN) Security Council session. If a China-Vietnam military crisis stemming from any of these three contingencies escalates to deadly violence, the United States should strongly urge the UN secretary-general to convene an emergency session of the Security Council. ASEAN cannot for now mediate crises involving Hanoi because the current ASEAN secretary-general is a Vietnamese diplomat. Convening an emergency UN Security Council session could appear to China like a strategy designed to publicly humiliate Beijing, but Washington should make clear to Beijing and Hanoi that the goal would be to provide a venue for discussion. Still, the United States and other nations would reserve the right to use the session to initiate resolutions calling on one or both sides in the conflict to de-escalate or face sanctions, though China could use its veto to block any resolution it opposes. Coercive: Signal U.S. commitment to Vietnam. If a military crisis develops from assertive and unprovoked Chinese actions in the South China Sea, or a Chinese response to a U.S.-Vietnam military exercise, the crisis escalates to deadly violence and threatens freedom of navigation, and no other options defuse the confrontation, Washington could send a U.S. carrier group into the South China Sea to prod Beijing's leaders to sit down with senior Vietnamese leaders and a mediator to resolve the dispute. The most effective U.S. strategy for lowering the risk of a China-Vietnam military crisis is one that combines the following options: using ASEAN to foster multilateral trust-building in the South China Sea, promoting written and clear guidelines for addressing maritime disputes, making U.S. policy clearer regarding treaty allies with South China Sea claims, bolstering the defense capabilities of Vietnam and other Southeast Asian partners to deter increasingly assertive Chinese activities in the South China Sea, and minimizing U.S. involvement in any China-Vietnam land border conflict. Strengthen ASEAN's mediation capabilities. When a diplomat from a country other than Vietnam takes over as ASEAN secretary-general in 2018, ASEAN may be able to play a role as mediator between China and Vietnam. Vietnam, one of the newer members of ASEAN, values its membership in the regional organization and strives to be seen as a country that pays heed to ASEAN's leadership. The United States should encourage mediation by ASEAN's secretary-general and help strengthen the ASEAN secretariat's capacity for conflict mediation. The United States should offer between $2 million and $4 million annually in aid designated to help the Institute for Peace and Reconciliation hire more staff and send them to learn techniques from other countries that have mediated conflicts in Southeast Asia, such as Norway. Encourage China and Vietnam to move forward on their MOU for resolving maritime disputes. The United States should encourage both sides to resume negotiations toward agreed-upon rules for handling China-Vietnam maritime disputes. Make a South China Sea code of conduct a priority of U.S. diplomacy. U.S. officials, including President Barack Obama, should use visits to East Asia to demonstrate U.S. support for regular China-ASEAN negotiations on a South China Sea code of conduct. The U.S. ambassador to ASEAN should make a unified ASEAN position on a code of conduct a top priority of her mission. Clarify U.S. positions on defending partners in the South China Sea. The United States should use public statements to more clearly define the U.S. commitment to defending Philippine forces in disputed areas if they come under unprovoked attack. Expand the U.S.-Vietnam defense relationship. The United States should work to expand access for American naval vessels at Cam Ranh Bay and increase the number of training programs for senior Vietnamese officers, in preparation for U.S.-Vietnam naval exercises in the future. Boosting training could be accomplished by doubling the number of Vietnamese enrolled in United States' International Military Education and Training programs by 2020 and by inviting more senior Vietnamese officers to observe the annual Cobra Gold multinational Asian exercises held in Thailand. The United States should also increase lethal arms sales to Vietnam, although these sales should be limited to naval and air assets. The Obama administration could set up an interagency working group to approve the first year or two years of arms sales to Vietnam, monitoring the sales to make sure that the weapons are not being used against Vietnamese civilians. Bolster relationships with other Southeast Asian partners. The United States should strengthen deterrence in the South China Sea by formalizing and expanding the already close U.S. relationships with Singapore and the Philippines. The United States should build on the 2014 ten-year Enhanced Defense Cooperation Act signed between Washington and Manila by increasing the size of the annual U.S.-Philippines Balikatan joint exercises from around eleven thousand participants to as many as twenty thousand by 2020 and by improving the interoperability of forces. With Singapore, the United States should, in secret, approach the Singaporean government about the possibility of signing a formal treaty alliance. Signal to Hanoi that the United States is not prepared to extend cooperation to a land border conflict. The United States should signal to Hanoi that closer U.S.-Vietnam strategic cooperation will not include a U.S. defense of Vietnam's land border—unless Vietnam is attacked, unprovoked—by limiting future U.S.-Vietnam joint exercises to naval exercises and air exercises in the South China Sea.